There is no better way to spend your Sunday than having brunch. While I like going out for brunch, sometimes I feel like I can never get exactly what I want and it can get expensive after a couple mimosas! 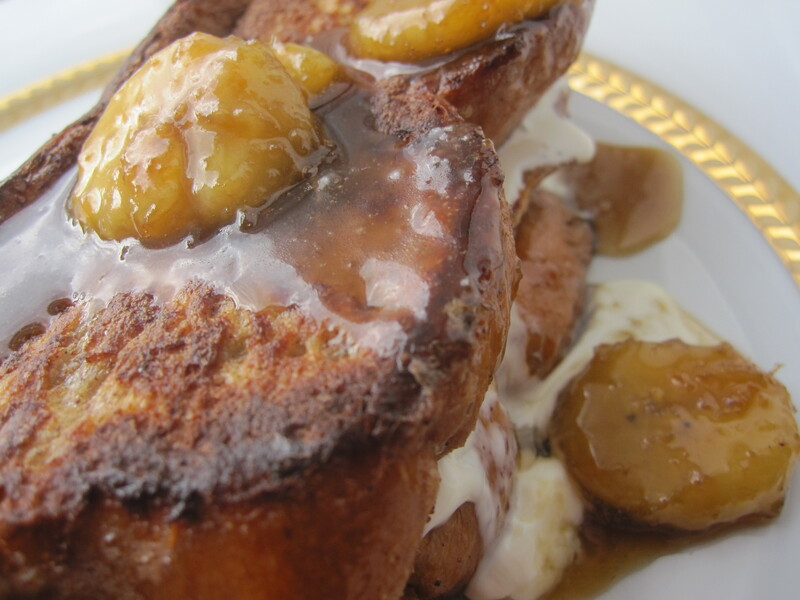 One of my favorite things to make for breakfast/brunch is french toast with brown sugar banana sauce. I don’t always add mascarpone, but it just adds a little something extra to take this to another level of good. Whisk together eggs, cream, cinnamon and vanilla together in a shallow dish or bowl. Soak each piece of bread in mixture to be sure each piece of bread is coated. Heat a cast iron skillet or griddle over medium heat and add a little butter to coat the bottom, about a teaspoon. Add French toast and cook about 4 minutes on each side until French toast is crisp and golden on the outside. Repeat until you have cooked all of the French toast. This will make enough for 4 people, but you can half the recipe if needed. 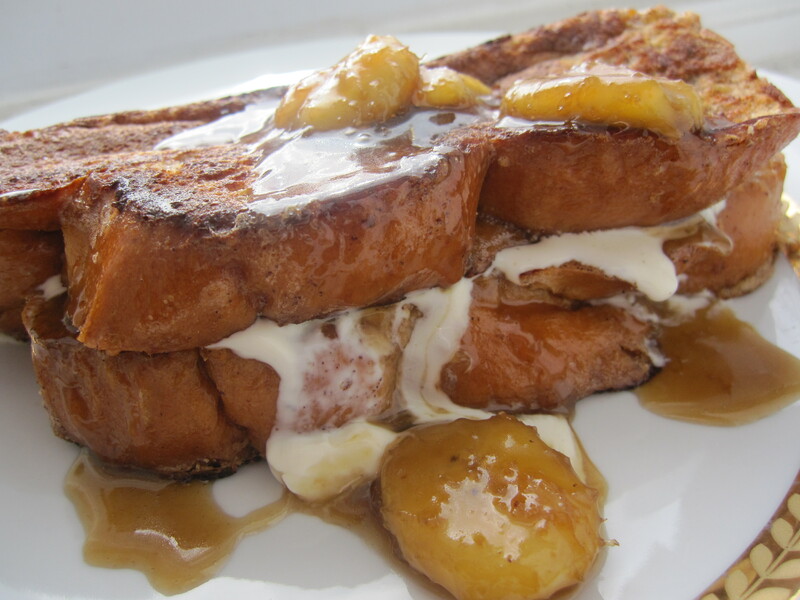 To assemble, spread mascarpone on one slice of French toast and top with another. Spoon brown sugar banana sauce on top. Melt butter in a small saucepan over medium heat. Add brown sugar, vanilla, and cream. Stir sauce until sauce is smooth and combined about 2 minutes. Add bananas and cook and additional minute. This looks great! I know my husband will love this…can’t wait to try it! Thanks for sharinga! Thanks for the invite! I just uploaded my pic! I saw a picture of this on yumsugar.com and immediately started drooling. Unfortunately my fridge is empty since I’m moving soon, otherwise I’d make this for lunch! That looks amazing! Need I not ask the caloric intake….just ENJOY!!!! French Toast is so unhealthy, but I love it. Just made this for supper along with fresh strawberries in sugar sauce/nutella option OMG! Very rich and turned out wonderful! (the fruit cancels out the butter, heavy cream, mascarpone and sugar, calorie-wise ;o) Also made turkey breakfast sausage. That sounds delicious with the strawberries and nutella! I will definitely be trying that! I ended up mixing the bananna sauce with the fresh strawberries & sauce on top of a mascarpone/nutella stuffed french toast,LOL! SO YUMMY!